In 2008 Farnham Equipment Company’s Maintenance Solutions Team quoted and performed the first of many seating inspections and repairs at The College of Wooster Timken Gym. Over the span of 10 years, Jim Davis would contact FEC to come back for repairs with a major overhaul in 2012 that led to the start of budget planning for a new seating system that wouldn’t come to fruition until 2017. The existing seating was installed in the late 60’s, a unique set up with the main seating bleacher bank split/separated in two banks with the intention of creating two separate courts and gym spaces. The freestanding reverse fold bleacher for rows 1-13 was 7’ deep by 12’h by 104’ long and separated the two gyms. Behind the freestanding reverse fold bank was the massive wall attached bank for rows 14-30 at 24’ row spacing. The bank was 8’d by 28’h by 104’l. When opened, the wall attached bank would meet up with the freestanding reverse fold to create a single bank of seating. This very large bank would take a lot of time, manpower and prayers to open and close due to the size and age of the structure. The seating opposite the large bleacher bank was typical seating. A recessed bank 13 rows at 30” row spacing by 104’l with wood backs on the main court and another 14 Rows at 24” row spacing by 104’l freestanding reverse fold in the balcony. May 2017, discussion began and challenges presented themselves. First was to design the largest freestanding reverse fold bleacher bank intended to divide the two gyms and match the height for the cross aisle. 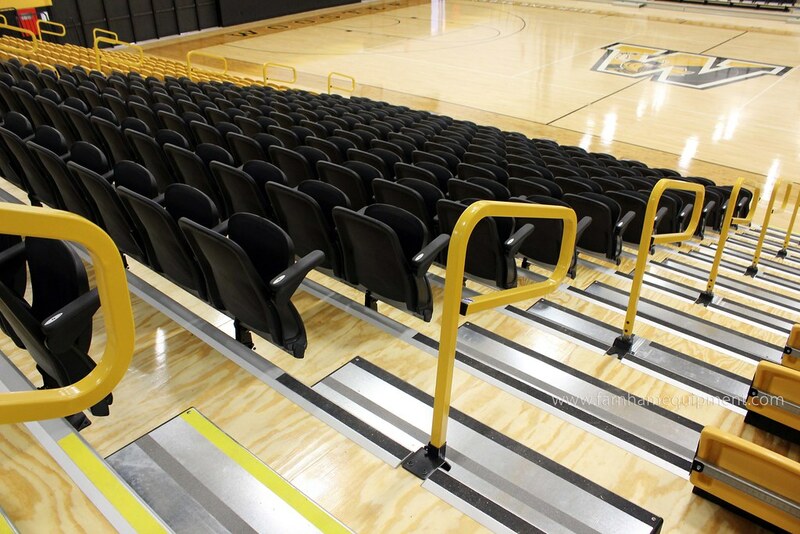 Hussey Seating Company would not engineer two separate bleacher banks like the existing seating and accepted the challenge to truly make this seating system work for the College of Wooster. The final design was a 22-Row system. Rows 1-14 have a custom rise (to meet the balcony door way height, with 33” row spacing, Metro and Contour seating, a 6’6” cross aisle, then rows 15-22 at 26 row spacing with CourtSide Seating, for an Open dimension of 58’7”deep, by 104’l. The top seat is at 18’2” with an over height of 22’3”. The closed dimension is 10’9”d. To help reduce weight, we designed the back panel to have a 10’ x 104’ banner above the 10’ plywood back. A local company manufactured the “FIGHTING SCOTS” banner for us. Challenge Accepted. To date this is the largest freestanding reveres fold bleacher bank in Hussey Seating history and only takes one person a few minutes to open and set up. Opposite the reverse fold freestanding bleacher bank we matched existing seating on the main court with a wall attached recess bank with 13-Rows of Metro Chairs and Contour backrest at 33” row spacing transitioning to the balcony to a 14-Row 26 Row spacing with CourtSide seats. Both banks at 104’ in length. Next, Delivery. In 2010 the college built the Scot Recreation center next to the Timken Gym, closing off direct access into the gym main court level. Mike Kirk, Project Manager for Farnham had to get creative with a solution for delivery that would include a crane to lower all the main floor material into the patio/pit area emergency exits. But there wasn’t direct access there either – the delivery truck would need to park on the street with a hillside barrier to the sidewalk. Installation was phased in collaboration with the gym’s floor replacement. Challenge Accepted. Plan in Place. 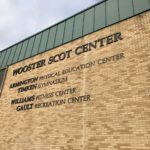 Pat Kindelin took some time to meet with Jeffrey Bricker, Scot Center Operations Manager, see below for what he has to say about the refreshing face of Timken Gymnasium. The overall team work at Farnham Equipment Company with Rocky Baker and the Service Department, Kami Wernimont for helping put this video together and to Mike Kirk and his team of installers made for complete team effort for a project 10 years in the making for Farnham Equipment Company.